If you hadn’t already noticed I love a good old afternoon tea. I always find it a bit weird when someone says they don’t like afternoon tea, what’s not to love? Sandwiches, cakes, tea and champagne is a yes, yes, yes to me! 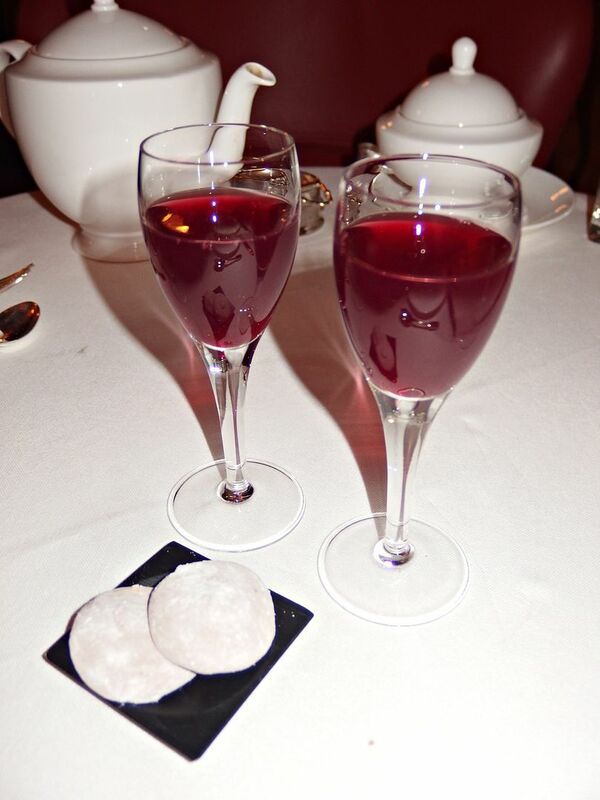 Danny and I had the pleasure of being invited along to the Café Royal on Regent Street to try their High Society tea. 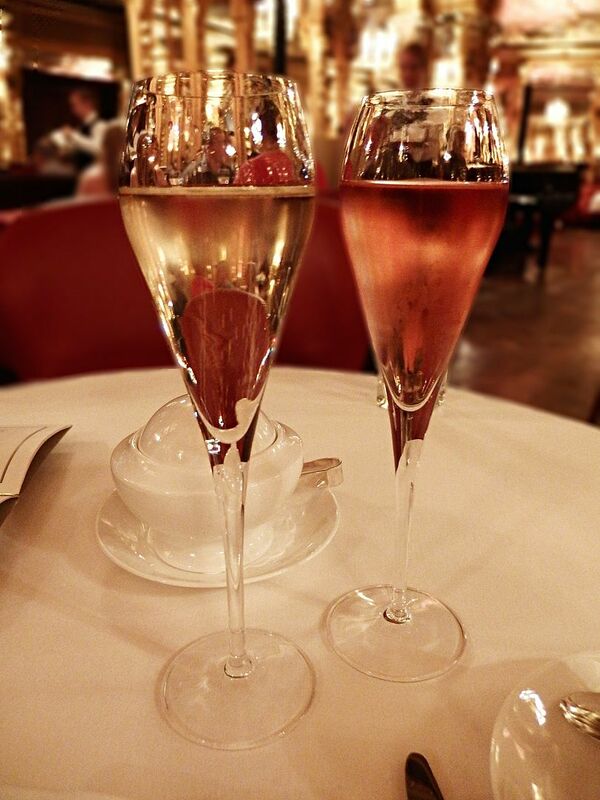 Afternoon Tea at the Café Royal feels like it should always come with an invitation as when you walk into the Oscar Wilde Bar it is so grand and breathtaking you sort of feel like you should be in a ballgown. This is where Oscar Wilde himself would frequent daily and the room has been restored to its original Louis XVI detailing. To our left we had a lovely lady playing the piano which was very relaxing and the decor itself is just something to sit and admire. 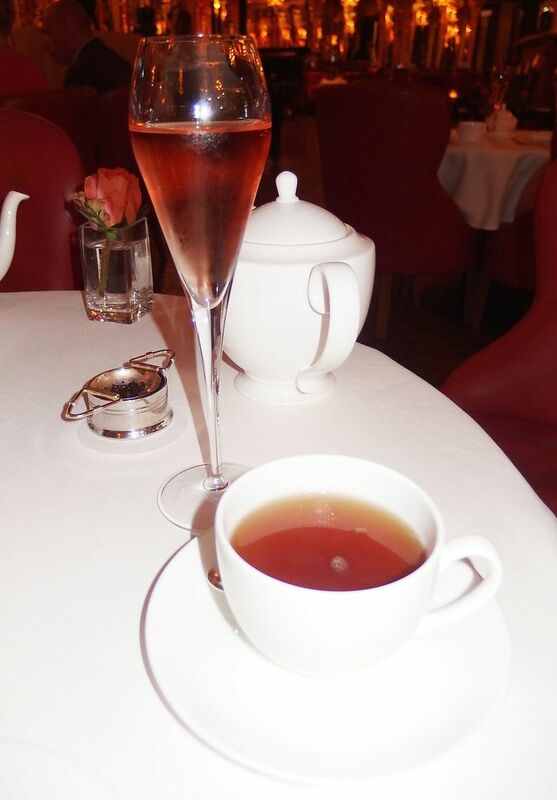 To start off our tea we both selected a glass of Veuve Clicquot and I chose the rosé option, which was lovely. For teas, I really liked how they had such a selection. 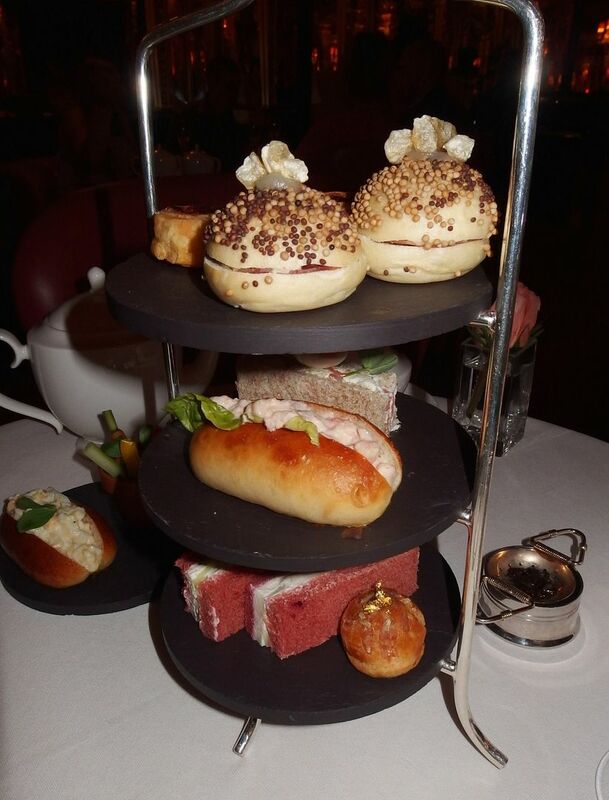 With some afternoon teas you only get the standard options, not at Café Royal, there were so many to choose from. I started off with a Lychee & Rose Noir and Danny had the Oscar. I really like a fruit tea and this didn’t disappoint me. 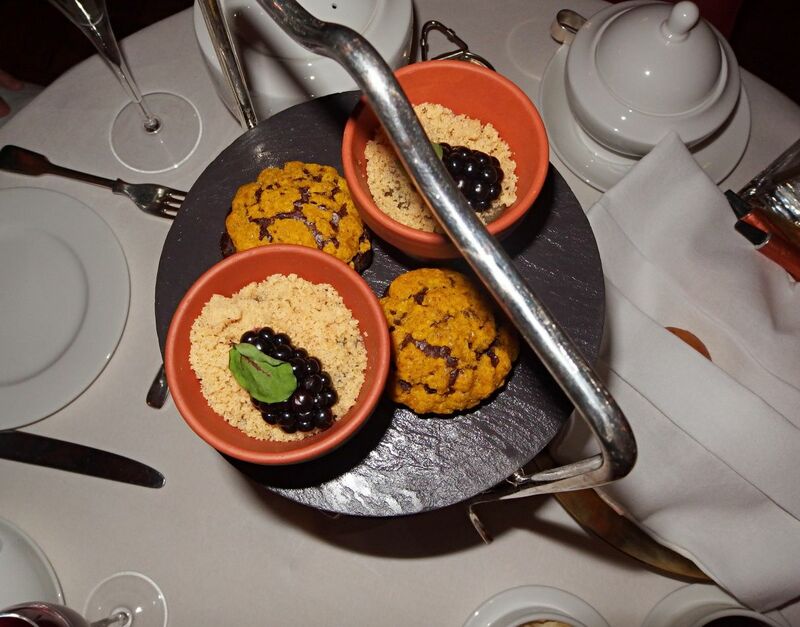 Now when you go to Café Royal for Afternoon Tea, make sure you are hungry! 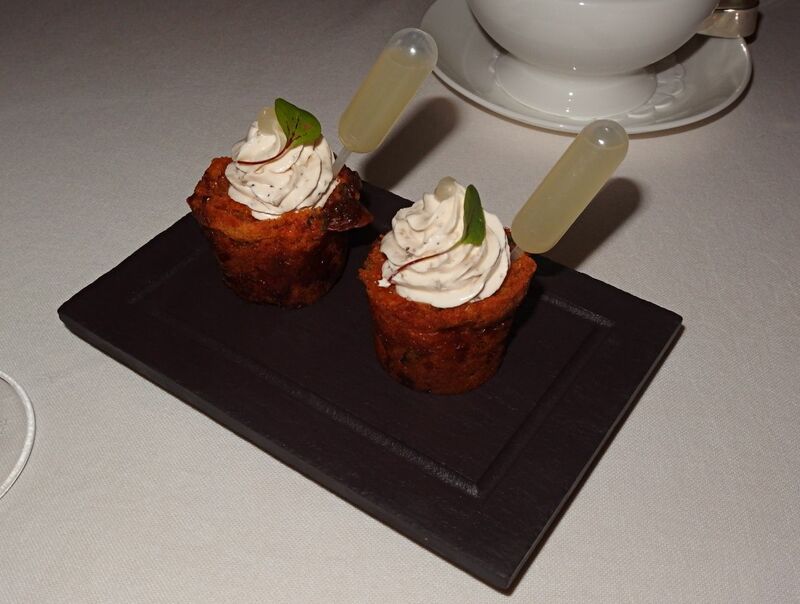 First up you start with a beautiful Amuse Bouche, sidecar muffin with a filled pipette. This was really tasty and had me ready for the savoury section of the tea. However I was slightly disappointed with the sandwiches. Mainly because I am not a big lover of seafood like prawns and salmon and that’s exactly what it was. But if you love this you will love it! I also found the cream cheese a bit overpowering in some of the sandwiches. That aside I really enjoyed the wild boar, crackling, pickled apple and mustard bun, more of those please! Before the sweet section you have another palette cleanser, this time an iced fruit tea and marshmallow. I really liked all these additional touches and made me forget about the sandwiches. The cakes however made my eyes light up. 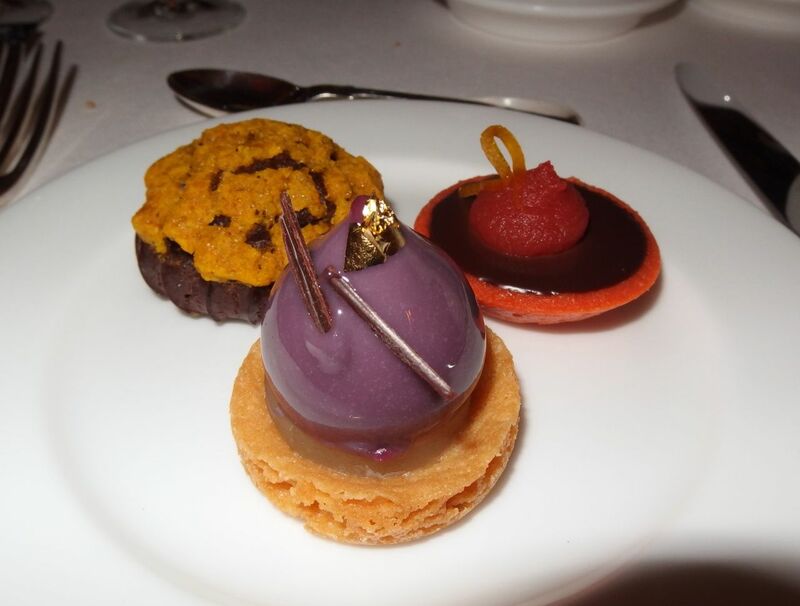 They looked amazing and so well presented, there was the ‘Profile 66’, ‘Opera 1865’, an absinthe green fairy macaroon, seasonal flower-pot, blackberry and apple regent and a cream filled choux. Not forgetting the scones of course which come with all the additions, jam, cream and a squeezy tube of lemon curd! With sweets I also decided to try another tea, this time the coconut. I must say I have never had coconut tea, so it was really interesting to try it. 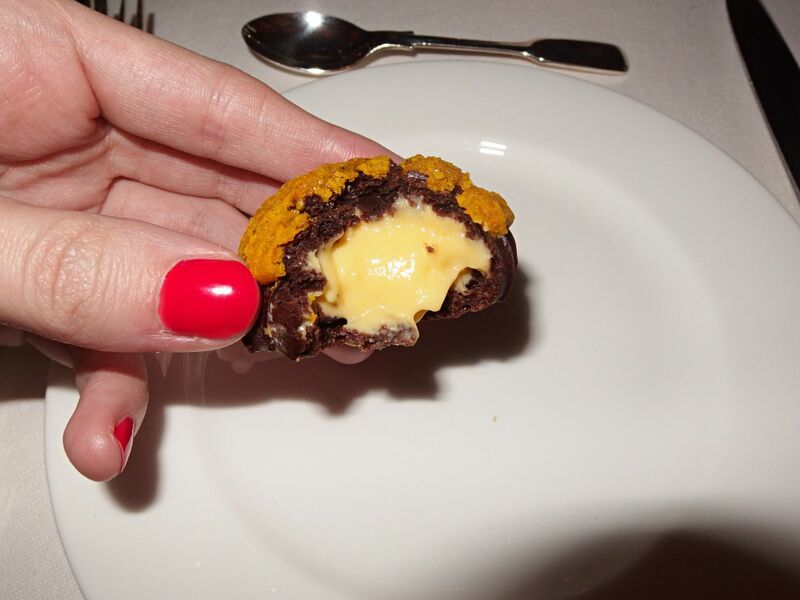 When I drank it with the cream filled choux it really gave it a coconut taste too, so was a great way to compliment the cakes. Afterwards you can help yourself to extra cake, but we were absolutely stuffed! I have mixed views of this afternoon tea overall, I really liked the setting and the staff were very helpful, plus it has some lovely touches to it. 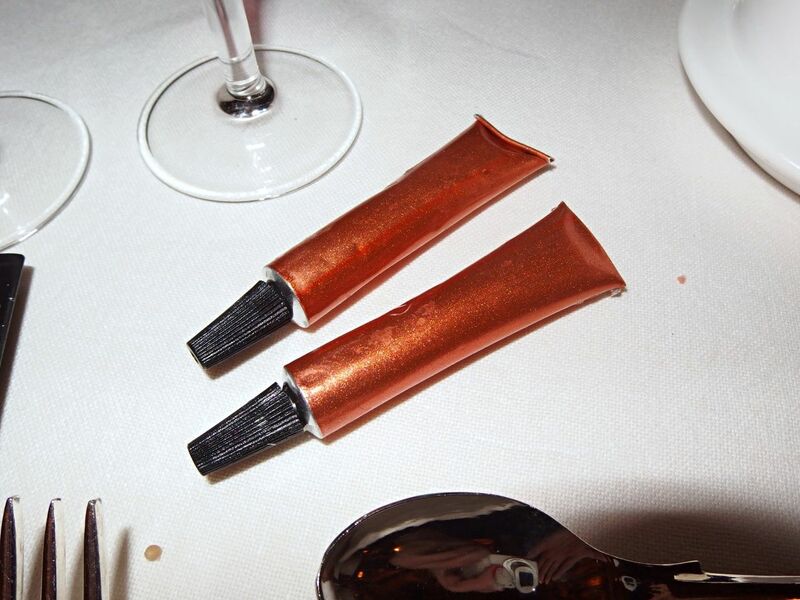 I just found the food a bit indulgent and a bit too much for me. There was nothing wrong with it, just my personal preference I guess. The High Society Tea is priced at £42pp, £55 with a glass of Veuve Clicquot, £65 with Veuve Clicquot Rose and £85 with a glass of Dom Perignon. You can find out more and book at hotelcaferoyal.com. Oh and gents must wear a jacket, tie is optional. I love it when afternoon teas are really innovative and different. This looks great!